I was working on a question submittal and response tracking system last week and I got stumped with a Nintex workflow failing. There's nothing like a long weekend to clear your head, because I had the solution in a few minutes effort this morning. Problem Description: A question coming into one list, needs to create a slot for the response tracking in another list. Easy-peasy except that every time I tried to set the "submitter" field in my destination list to the "created by" value in my source list, my workflow was failing. Oddly enough it would give me the failed to start status, but when digging in deeper, the actual problem was "failed to update list item". My submitter field was defined as a person or group field that did not allow multiple users. 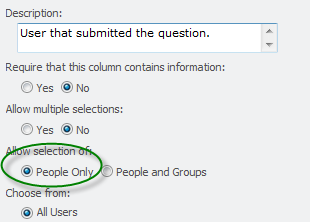 This morning, I found that I had to change the submitter field to only allow people, not people and groups. Once that change was made, the workflow completed successfully.